It’s funny how all the little girls I know tend to fall into one of two camps – they either love fairies or they adore horses. While beautiful fairy dresses pretty much grow on trees these days, the same can’t be said for equine-inspired clothing. So here’s a pretty frock that will have little horse fans whinnying in delight. The Prancing Pony pinafore from Melbourne label Wolf and Willow is all sorts of cute. Made to a genuine 1950s design, the red pin dot fabric is emblazoned with sweet little bumblebees. Then there’s that stunning little pony, with its exquisite hand-embroidered detail. The dress can be worn as a pinafore or the straps, which criss-cross at the back, can be unbuttoned and detached to make a swing skirt for your little rocker. Giddyup! 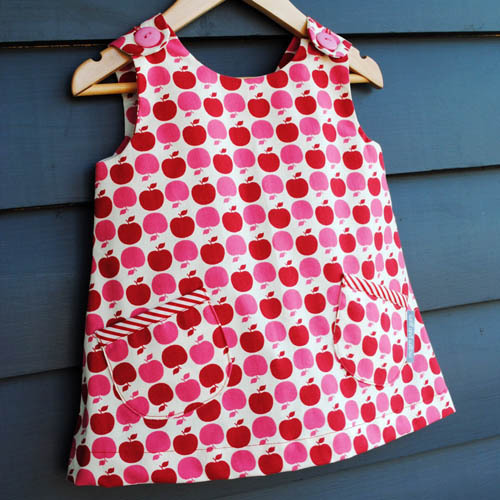 I also adore Wolf and Willow’s delectable Toffee Apple pinafore in all its modish pink and red glory. This one’s based on a vintage pattern from 1971, which just goes to show that good design never dates! 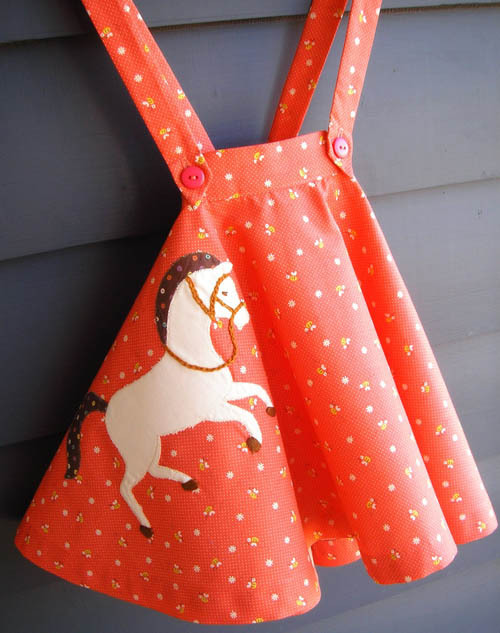 The Prancing Pony pinafore is available in a size 4 and costs US$75 plus shipping from Wolf and Willow’s Etsy store. The Toffee Apple pinafore comes in a size 2 and costs US$44.